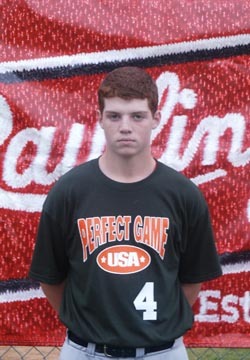 Mike Fallis is a 2010 LHP/1B/OF with a 6'0'', 165 lb. frame from West Chester, PA who attends West Chester East. Mike has a lean athletic build with some room to fill out. At the plate Mike has a line-drive hitting approach and shows the ability to square up some pitches. He tends to be a little stiff in his hitting approach at times causing him to roll over ball if everything is not working together. In the outfield Mike has good footwork with a short arm action. He does a good job staying in front of the ball at first base and has nice skills around the bag. On the mound Mike throws from a 3/4 arm slot with a short arm action. He is around the plate with all of his pitches and shows feel for a 2 to 8 curveball. Mike is a very strong student that should attract the attention of some smaller college programs.